In this week's blog, I am talking about holiness. The Greek word for 'to make holy' in Hebrews 2:11 is the word 'hag-ee-ad'-zo' which means to ceremonially purify or consecrate; to sanctify. This is the same word used in Romans 15:16 where Paul writes that the offering of the Gentiles is 'sanctified' by the Holy Spirit. 15 But just as he who called you is holy, so be holy in all you do; 16 for it is written: “Be holy, because I am holy.” (NIV) If we look at this command to 'be holy as God is holy' in our own natural ability, we will most certainly feel completely overwhelmed. For in our hearts we know that the truth is, no matter how good we can try to be, it is simply not possible to live up to God's standards in our human effort. Romans 3:10 clearly tells us that there is no one who is righteous...not one. James affirms this by saying that if we keep all of the law every day of our lives and just make one tiny mistake, it is as if we have broken the entire law (James 2:10). So it is obvious that the road to holiness is definitely not based upon on our natural ability to keep the law because we just can't do it. While we may all agree that Hebrews 10:10 is a theological truth, how does it work out in our lives on a day to day basis? Do we live each day knowing that we are completely loved and accepted by God no matter what we do? Do we live our Christian life with the life changing realization that the finished work of Christ on the cross was enough? Do we truly believe that that we are holy even as Jesus is holy even when we fail? ...Or do we still act as if our sanctification is the result of our own self-effort? Unfortunately the definition of holiness in many evangelical circles is more about our behavior modification rather than our being a completely new creation in Christ (2 Corinthians 5:17). The truth is that if holiness is something that I can do in my own strength by keeping the law, then Christ died in vain (Galatians 2:21). Even though I know that I have already been made holy by the blood of the Lamb, there are still days when I act as if it is something that I am supposed to make happen in my own strength. If you are anything like me, you may wrestle with this from time to time too. It is a kind of a spiritual schizophrenia where we live our lives pulling out flower petals repeatedly saying "He loves me, He loves me not" depending upon our performance and our circumstances. It is at these times that we may find it easier to believe that we are holy on the good days when we read our Bible, pray and maybe witness to others. But what about on the bad days? ...When we are discouraged, fearful and not full of faith? Can we believe that we are still absolutely loved and set apart for His purposes in these dark and lonely times? The remnant of the orphan heart that still remains in us struggles to believe that God's love and His extravagant grace and mercy are more than enough. The part of us that has not yet surrendered to love still believes that we have to do something in order to be accepted. I know that this is a poor example, but our son Steve will always be an 'Adams'. He was born into our family and will carry our name no matter what he does in life. He didn't do anything to earn being part of our family, he was simply born into it. I think this is but a shadow of what it means to be born into the family of God. When we become born again, we inherit everything good that is in God's family. Jesus' holiness, His righteousness, His relationship with God... everything! To walk in holiness is not to live by a set of do's and don'ts in our lives, but to simply live out of the new spiritual DNA that God has already deposited in us by His Holy Spirit. We are God's kids (1 John 3:1) and are partakers of His divine nature (2 Peter 1:4)! 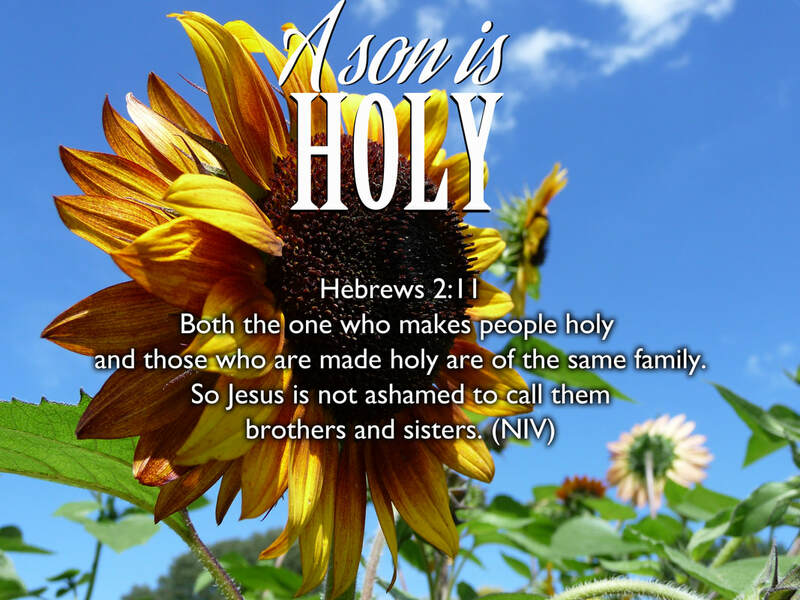 The only reason we are holy is because our Father and our Big Brother are holy! ...Not because we could do anything to ever earn it, deserve it or sustain it. I believe that our God and Father wants to love all of the remaining orphan beliefs right out of us and convince us that the shed blood of Jesus is enough. Period. My prayer today is that our Heavenly Father would give us a deeper revelation of the 'once and for all sacrifice' of our Elder Brother Jesus. I pray that we would all know beyond a shadow of a doubt that our holiness, our righteousness, our sanctification, and our eternal acceptance is not rooted in our own efforts but in the everlasting and immeasurable love of God. I pray that we would know that God already sees us as holy because of our union with the Firstborn of many brothers and sisters (Romans 8:29). The unalterable fact that Jesus is not ashamed to call us His brothers and sisters should cause us to shout the good news from the rooftops! We share the same spiritual DNA as God Himself (1 John 3:9) and as a result, we share in His holiness too! May each and every person who has called on the name of the Lord know that we have been made holy simply because we have been joined to Jesus who has become our righteousness and our sanctification (2 Corinthians 5:21). May this good news cause you to cease from your own self effort and enter into the glorious Sabbath rest of Almighty God (Hebrews 4:9-11) and sink into your new identity as a much loved, holy, child of the Most High.